Modular patch panel with integrated cable tie shelf, integrated grounding system, 19" fastening kit, labeling fields with exchangeable labeling strips. The ports are prepared for a visual color coding system and automated infrastructure management systems. Panel polycarbonate, fiber-glass-reinforced, halogen-free material, UL 94 listed and steel: DC01 (1.0330), 1.5 mm. Color front: black (RAL 9005) / steel: blue, chromatized. 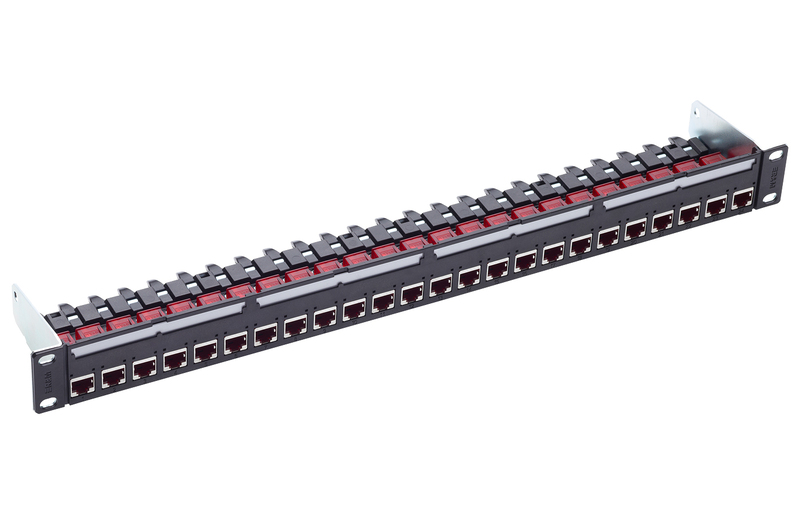 24 ports populated with RJ45 connection module of Cat. 6A ISO, for the setting up of transmission channels of Class EA with up to 4 plugged connections acc. to ISO/IEC 11801 ed. 2.2, June 2011, EN 50173-1 May 2011 (DIN EN 50173-1) and Class F on 2 pairs, complies with Cat. 6A requirements of the standards ISO/IEC 11801 ed. 2.2, June 2011, EN 50173-1 May 2011, as well the U.S. standard Cat. 6A according to TIA 568-C.2, re-embedded tested in acc. with IEC 60603-7-51 and 60512-27-100, interoperable and backwards compatible with Category 6 and Category 5e. Suitable for 10GBASE-T applications in acc. with IEEE 802.3™ Section Four up to 500 MHz and 100 m.
Compatible with RJ standard plugs (RJ11, RJ12, RJ45), connection with automatic wire cutting of installation cables AWG 26 – 22 (0.4 mm – 0.65 mm) and flexible cables AWG 26/7 – AWG 22/7 without special tools. X-Separator for individual pair shielding. Parallel pair termination without crossover in acc. with TIA 568-A/B, gold-plated bronze contacts for >1000 mating cycles, IDC contacts with >20 insertion cycles, contact resistance <5 mOhm, dielectric strength >1000 Veff. PoE and PoE+ compatible according to IEC 60512-99-001. 90° wire orientation without bending cable. With integral cable strain relief, including dust cover. Shield contacting by patented shield lance with integral cable strain relief, shield material tin-coated bronze, ground contacting through 1 contact finger for flat connectors 4.8 x 0.5 mm. Connection module Cat. 6A ISO, shielded, with EMC cover, dust cover, cable tie and installation instructions.